Seth Accra Jaja believes the future of the green fields in the region is for the youths and that NAOC is already nudging them to the right path. The fields in the Niger Delta region should be green and lush instead of being black, owing to the adverse effect of oil exploration spanning several years. This is the ambition of the Nigerian Agip Oil Company (NAOC) with its Green River Project, which has triggered an agricultural revolution in the Niger Delta with the calibre of people that have embraced agriculture. But NAOC wants more: Niger Delta youths should join the revolution. 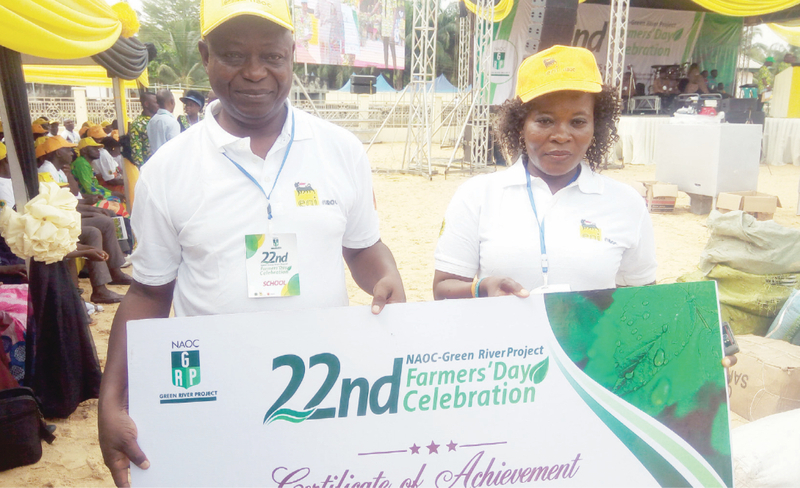 At the 22nd Farmers Day celebration at the NAOC-GRP Farms at Igbogene, gains and testimonies were signpost that the Niger Delta people have realised that there is an alternative to oil as mainstay of the economy and source of employment and livelihood. The success being measured is seen with the expansion of the GRP scheme in Bayelsa to include that of Yenagoa/Biseni/Samabri. “We are extremely proud that the idea that was conceived 31 years is still growing and waxing strong,” Tiani Alessandro, General Manager District said. The focus of the GRP has been to make framing attractive and easy for all those willing to go into it to make a living, especially the youths. The central role expected of Niger Delta youths to make the fields of the region green cannot be underestimated, especially as “agriculture contributes to major human priority such as eradicating poverty and hunger, boosting investment, rapid industrialisation and economic diversification,” said Seth Accra Jaja, Vice Chancellor, Federal University of Otuoke who delivered the keynote address. He believed the future of the green fields in the region is for the youths and that NAOC is already nudging them to the right path. “The most self-reliant youths I have ever met in my life are the agro-entrepreneurial youths. They do not need so much government attention; what they need from the government is the provision of an enabling agro-business environment. In this sense, we appreciate the role of Nigerian Agip Oil Company, operators of the Green River Project in creating sustainable and innovative paths out of poverty lane for many of the Niger Delta’s willing youths,” he said. The Niger Delta youths, Jaja argued, have no option than to join the league of wealth creators instead of those indulging in vices which are detrimental to the economy and ecology of the region. For him, making the fields green would set the youths on the same pedestal with their counterparts around the world. “The NAOC through its GRP JV and within its challenging limits has provided a bridge for the Niger Delta youths towards this beckoning opportunity. The track record of the GRP JV is a clear testimony that NAOC is standing with the willing Niger Delta youths in this drive towards the creation of new global age billionaires. Lorenzo Fiorillio, vice chairman and Managing Director of NAOC agreed with Jaja, as he pointed out that the theme of the 2018 celebration ‘Youths, agents for agricultural development in the Niger Delta’ was carefully chosen because of the company’s numerous impactful projects geared towards empowering the youths in particular and the people of the region in general. However, in the midst of the success, the challenges confronting agriculture in the region cannot be downplayed. Flood disaster is a major threat. 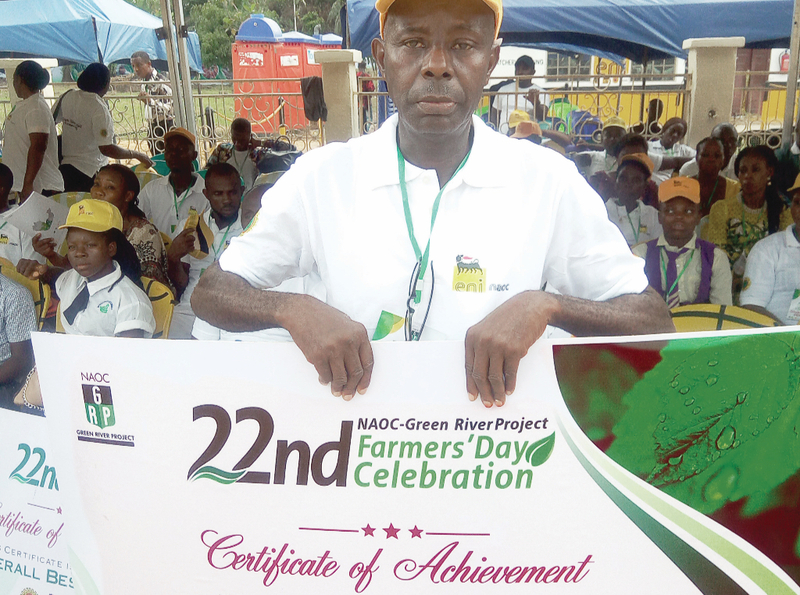 Dr. Victor Ajuru, Nwana Farms at Elele, Ahoada West Local Government Area of Rivers State who emerged the overall farmer of the year was full of praises for NAOC for their technical support noting that two challenges stand as obstacle to make Niger Delta fields green. “We have to overcome the apathy of the youths to go into farming. The natural disaster like it happened with the flood this year is a serious handicap,” he says. Mr. Charles Alele whose cooperative society went home with the Best Cooperative society said the ambition of NAOC to make all fields in the region green is a not too tall ambition. According to him, if the people keys into the dream, it would emerge the food basket of Nigeria. “We thank God and the NAOC for their wonderful support. We are into cassava farming, piggery and plantain plantation. The future of agriculture is very bright with the GRP of NAOC. And if it continues like this, the region would be able to provide food for the whole of Nigeria. Finance still remains our challenge because agriculture is very capital intensive,” he said, pleadingly.